You know a story’s hot when the source site’s down for exceeding its bandwidth. That’s the case with Rob Antill’s Digital Anthill. Back in January 2013, Rob got his mitts on a DJI Phantom. It’s a $500 USD drone with a video camera and pretty darned sweet if you ask me. During one of Rob’s inaugural flights over Kootenay Lake, just outside of Nelson, BC, he caught sight of something downright curious. Everybody and their brother thrilled at the possibility of Rob’s discovery writing a new chapter for North America’s history. Who wouldn’t be, considering labyrinths and spirals are a common motif in human art from prehistory to the 21st century? Basically, a labyrinth is a walking meditation; an opportunity for quiet reflection to connect with that place inside yourself where insights and understanding can occur. A labyrinth pathway spirals into a central destination, and then back out again, using the same path. The spiralling is said to mimic the convolutions of the brain, and it is thought that the right and left brain hemispheres become balanced when walking a labyrinth. This is what appears to support mental clarity and understanding to occur. Locals insist this formation is recent, and the product of Lakeside Labyrinth. A lively discussion on West Coast Native‘s Facebook page features a thread of comments in this vein. For bigger skeptics refusing to take local yokels at their word, Lost Kootenays shared an image of these stones from last March when the water was significantly lower. 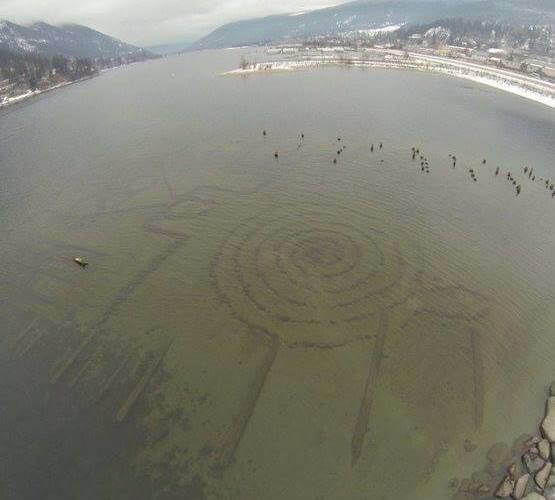 If the water level regularly reveals this spiral, it would hardly be a mystery to frequent visitors of Kootenay Lake’s shores. Don’t despair, as there’s still plenty of hidden wonders in North America. Twelve meters beneath the surface of Lake Michigan, researchers hoping to find old shipwrecks stumbled upon a 89 meter circle of stones. One of these stones appears to bear the image of a mastodon, evidence these giant beasts still roamed those ancient shores as the glaciers retreated. Considering this site’s depth, there’s almost no chance anyone flying a drone will stumble upon the site. Plus the site’s being kept secret out of respect for the Grand Traverse Bay Indian community in hopes of preserving the site for further investigation. This isn’t the only stone circle in the area. About 61 miles north of Traverse City, a stone circle was discovered on Beaver Island in 1985. Its 39 stones are arranged in a 121 meter circle. Allegedly they are aligned with astronomical events like the summer solstice, the rising of the stars Aldebaran, Rigel, and Sirius. If that doesn’t beat all, one of the stones appears to bear the carving of a bull on it.